Recently I became fascinated with all the different names Jesus has been given throughout the Bible. I should have been writing books, folding the laundry and washing my thirty-two windows, but I just could not stop digging through literature and Bible verses. I’m so glad I let my laundry pile up, my windows become more streaked and other writing delayed. I feel richer for the postponement of my regular duties. They waited patiently! 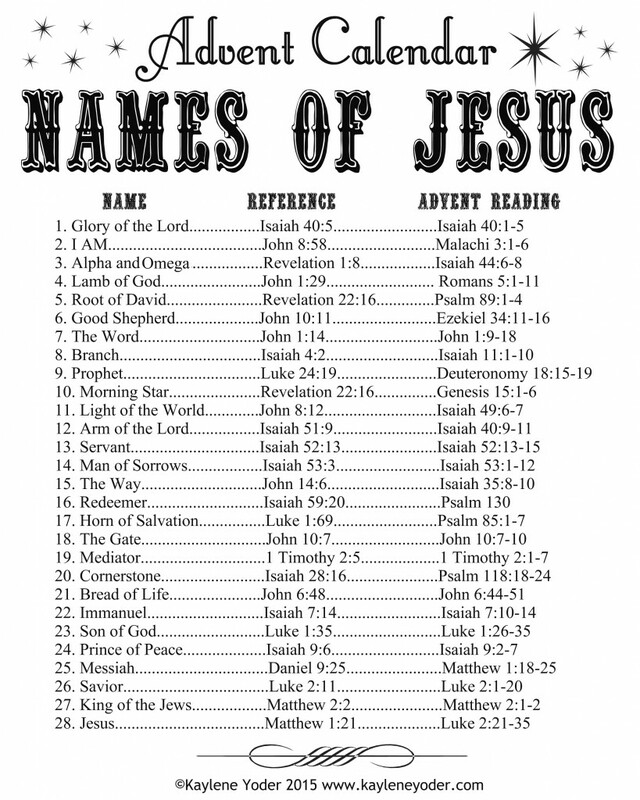 Halfway through my personal study of His names, I realized how much I want my children to learn them as well. So I compiled twenty-eight of them into an Advent calendar with a reading schedule that complies with both the Name of the day and the Christmas story. I haven’t been this excited about Christmas since I was a kid! 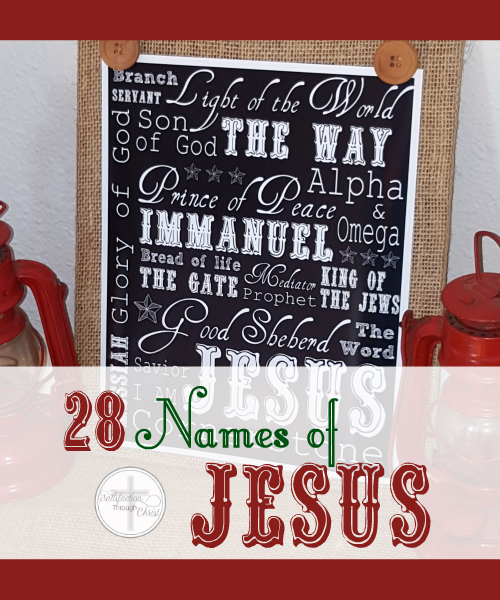 Here is a free printable Names of Jesus Advent Calendar. Just right click. Save. Print. Enjoy! You can find more ways of celebrating the name of our King in this “Names of Jesus Christmas Pack”, which includes 14 downloads the help you create an unforgettable Christmas theme this year! Kaylene is just a girl with a sword, a shield and a strong cup of coffee. She finds her first ministry to be in her home living out her calling of wife and mother. In her spare time she writes to encourage women to thrive well in their current roles. Be it through sweet encouragement or an occasional dose of humor or spunkiness, her goal remains the same... to point women to the Lord. How wonderful! I have been studying the names of God for a couple years now. This will be an added resource in my studies. THANKS YOU for sharing! Kaylene, I love this! Nothing better than the NAME of JESUS! What love I have for my beautiful Savior. This will go great with Christmas. I was wanting to have them write the names of Jesus out and this will be perfect to help! Thanks for your great gift to all of us! I always love to study the many ways scripture reveals His goodness and his character through the names He is given. Great list and I love that the scripture is right behind it to lead us into His Word. And nowhere in scripture is Christ referred to as ” the man upstairs” ? Just a thought !